Kristina Olsen is one of the most entertaining and compelling performers on the international folk circuit. 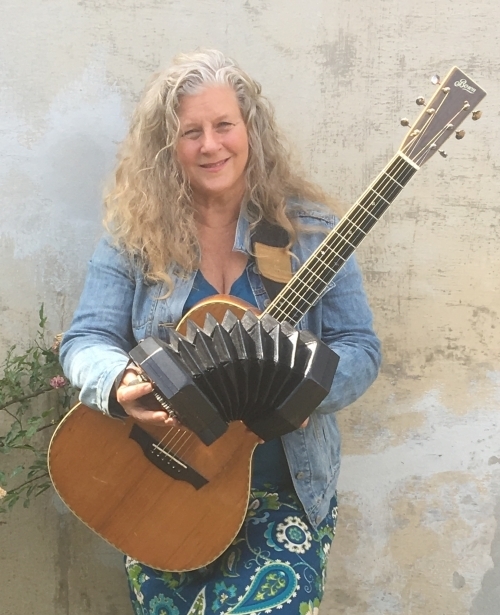 A superb multi-instrumentalist (acoustic guitar, steel-body slide guitar, saxophone, concertina and piano) as well as an award-winning songwriter with a big raw velvet voice, and now a book author, Kristina has audiences around the world coming back for more. Her mix of powerful songs ranging from sassy bottleneck blues to lilting ballads to swing jazz to raunch and roll (as well as her hilarious storytelling) makes for a diverse and satisfying musical experience, on stage and on disc. Born in San Francisco and raised in Haight-Ashbury during the 1960's, Kristina's approach to music and life was formed by that environment of vital cultural expression, social activism and diverse musical influences. Such respected artists as Eric Bibb, Fairport Convention, Maddy Prior, Mary Coughlan and Mollie O'Brien have covered and recorded songs by Olsen. Olsen has also worked as a session musician on numerous artist's albums including playing the hammered dulcimer on Michelle Shocked's album "Short Sharp Shocked" on PolyGram and toured as Mary Coughlan's guitarist in 2005 and 2007. Olsen has performed as a multi-instrumentalist in plays for the Mark Taper Forum in Los Angeles' Music Center. Olsen won the Kerrville Song writing award her song for battered women, "I'm Keeping This Life of Mine." She now calls Venice Beach, Los Angeles home but rarely sees it from touring ten months a year.